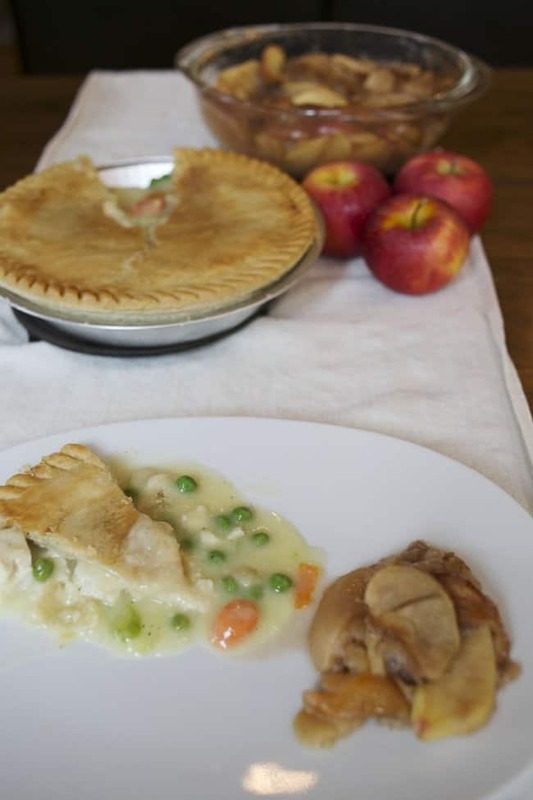 Nothing says fall comfort food quite like Chicken Pot Pie and Apple Betty. 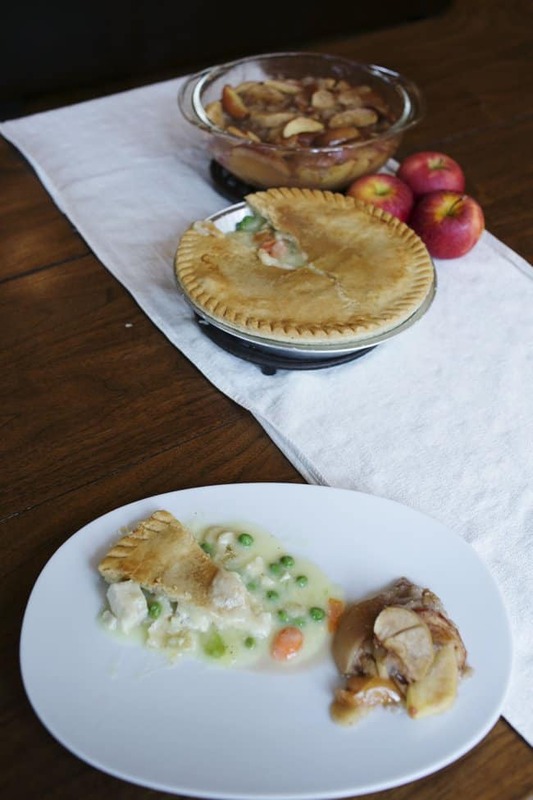 Two flavors I grew up on – chicken pot pies and my Grandma’s Apple Betty. My mom always kept Pot Pies ready in her freezer. That pie, fresh from the oven, was always comfort in a golden, flaky crust. I loved eating my own pot pie as a teenager, and now that the pot pies come in family size I can feed my whole family with one family size pie. This weekend, the weather turned rainy and fall like, so my mom and I decided to welcome the season with a pot pie and my Grandma’s famous Apple Betty. I jumped at the opportunity to learn how to make my Grandma’s Apple Betty, and I can’t wait to share the recipe with you! This delicious Apple Betty is the perfect paring for a family size pot pie. The pot pie bakes for 1 hour 35 min at 375 degrees, and the Apple Betty cooks beautifully at that temperature and time frame. Just preheat the oven, and put the Apple Betty together. Once the oven preheats put both the pot pie and the Apple Betty in the oven together. Even though I’ve been cooking for years, I still struggle with getting all the parts of my meal on the table at once. This pairing turns out perfect everytime- no worrying about one dish growing cold while waiting on the other! Wash and slice enough apples to fill a 2 quart dish, packed tightly. 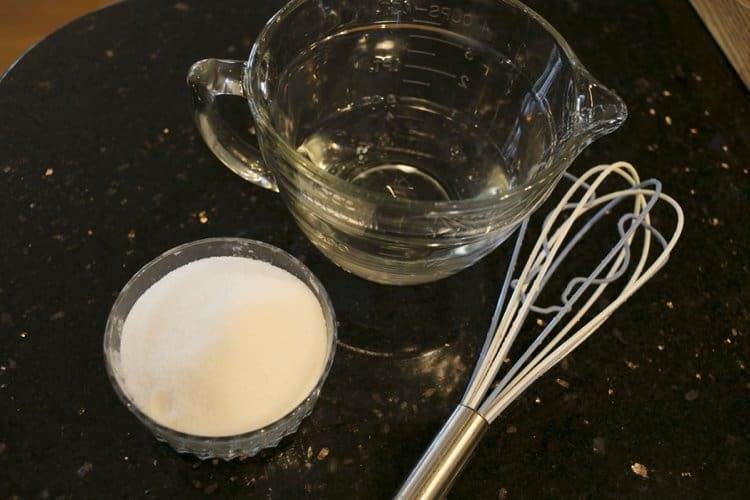 Mix 1/2 cup of water and 1 cup of sugar. 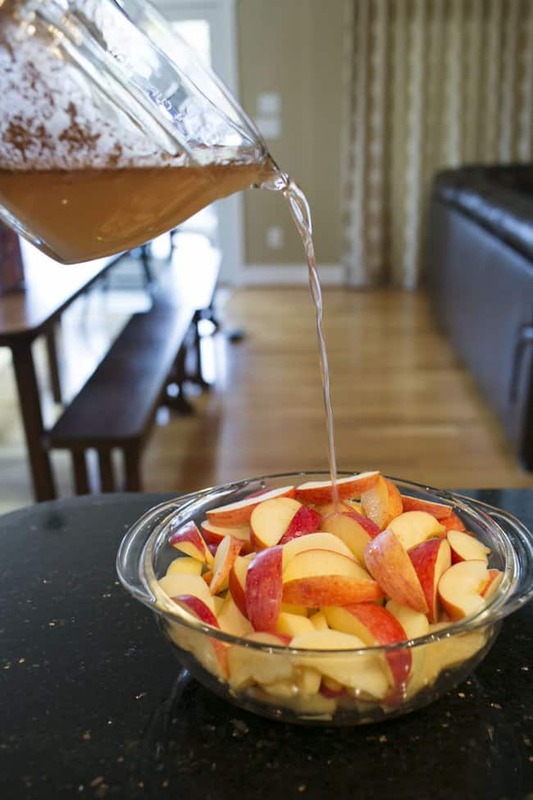 Pour the sugar-water mixture over the apples in the casserole dish. 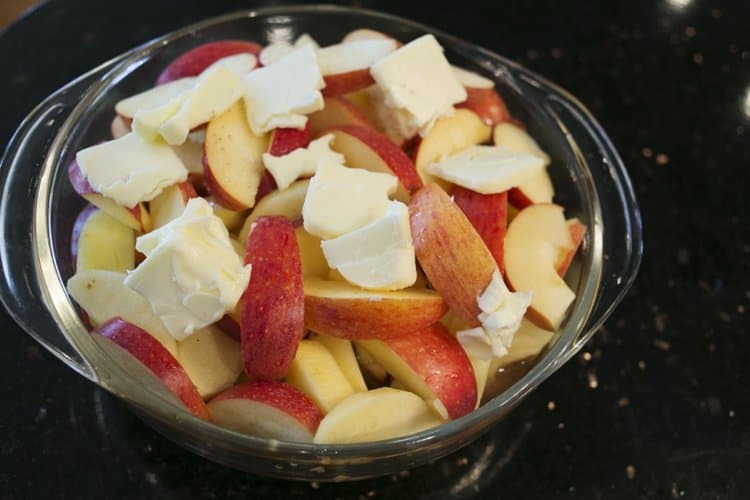 Cut 4 tablespoons of butter into small pats, and place them on top of the apples. 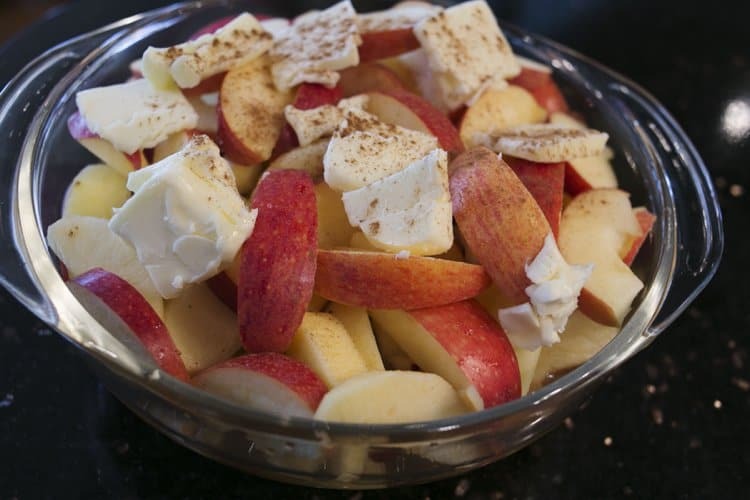 Sprinkle the top with 1/4 teaspoon each apple pie spice and cinnamon. 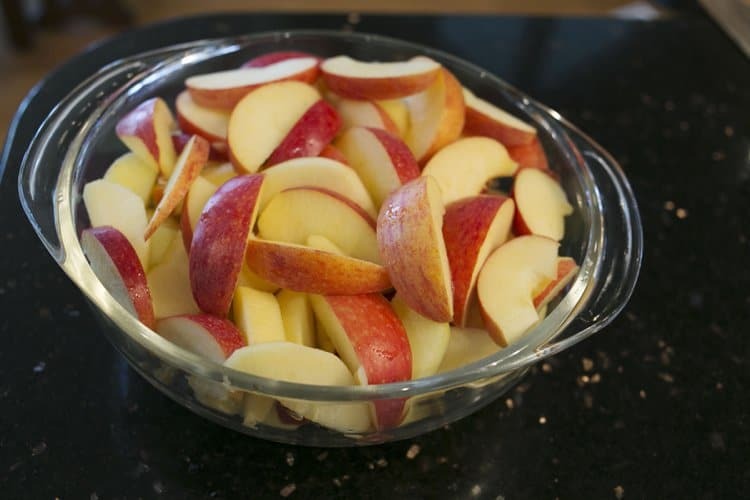 Bake the apples for 30 minutes, then baste them with the water in the dish. 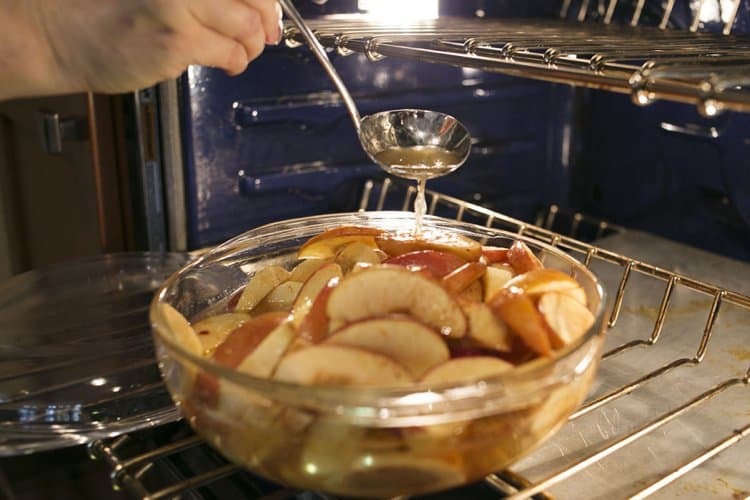 After another 30 minutes, remove the apples from the oven and add 3 slices of loaf bread, torn into small pieces. 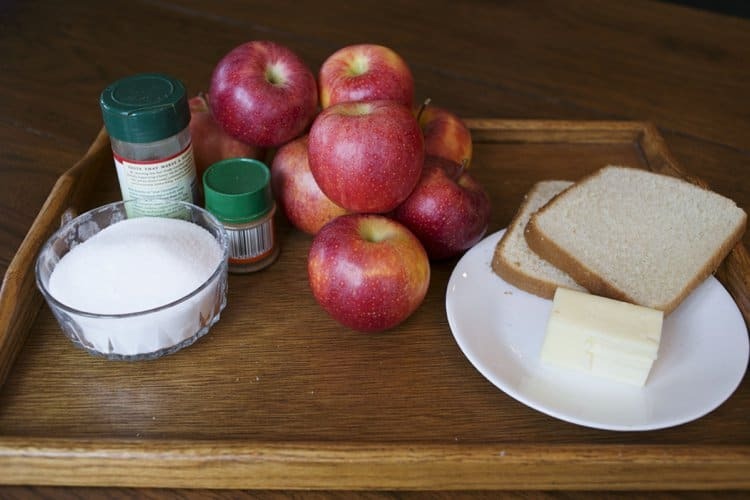 Gently mix the bread into the apples. Return the dish to the oven for another 20 minutes, or until the breading is slightly brown. 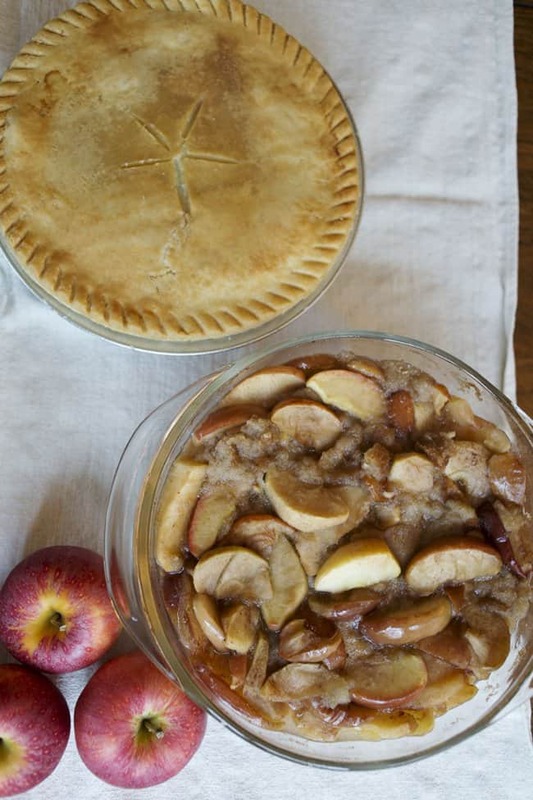 Now, remove both the pot pie and the Apple Betty from the oven for the perfect fall meal! 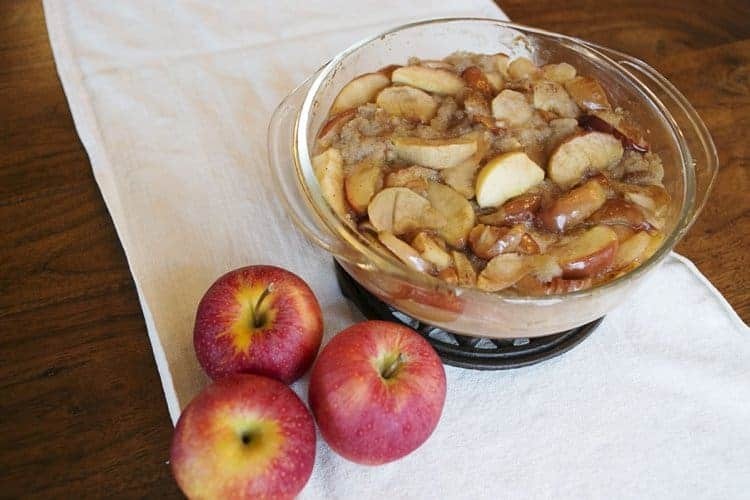 This Grandma's Apple Betty recipe looks so easy and delicious! Apple anything is my husband's favorite pick and I know he'd love to come home to a dish of this! My family loves anything with Apples so this will have to be added to my recipe pile. Thanks for sharing! Of all the frozen convenience foods out there, Marie Callender's is my absolute favorite. I love using prepared foods to cut down on weekday dinner prep --- and you have a great idea, pairing two items that can be cooked side by side. BOTH pies look amazing! It would be a pie night! Great warm comfort food for this time of the year! That is a total comfort food meal! My husband would go nuts for the apple betty! Chicken pot pie is such a comfort food and your Apple Betty looks like it compliments it perfectly! This is a meal that would be amazing on this cold winter nights! That Apple Betty sounds wonderful. I wish I had some right now. There's nothing like a warm chicken pot pie on a cold day. Marie Callender's has some great ones! That Apple Betty looks amazing. With the weather we are having I could really use some chicken pot pie. That apple betty looks so delicious. Love how easy that pie is to make and that chicken pot looks perfect for the cold weather here in Chicago. Hello comfort food! I always wondered what the difference was between a Betty and a pie. Looks delicious and easy! My husband loves pot pies. We get the Marie Callender's soups and he likes those a lot so I bet he would love their pot pies too! My son and I just had those pies this week for dinner. Had a coupon for 3 - now there's one left......ummmm who shall get it!!! They are good. This is exactly my kind of food, and I feel good just looking at your pictures of it! This looks delicious! I also often like pairing something store bought with homemade. Its a win win! Yum! 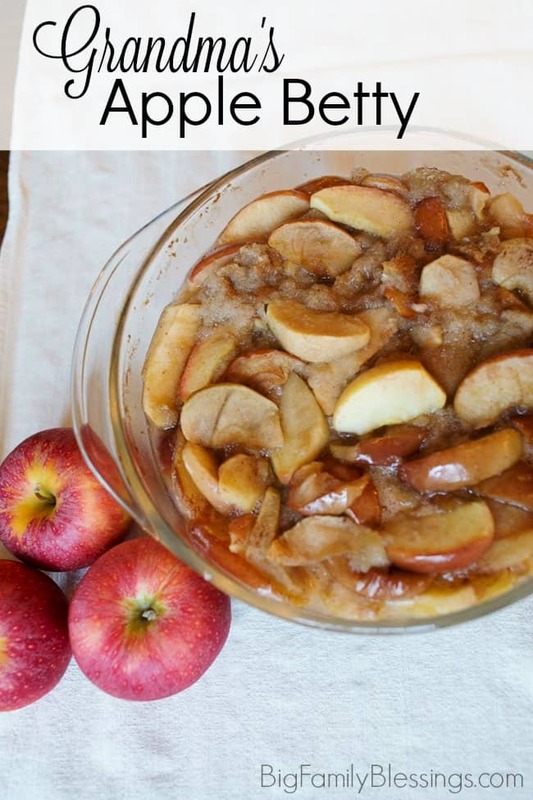 I have never heard of the apple's recipe, love it! Will definitely try! I'm kind of in love with your grandma and her Apple Betty right now. My little one would love, love this but he's allergic to wheat. I wonder if I could try this with a different bread. Now this is my idea of comfort food! I haven't had a pot pie in so long and that apple betty looks amazing!